The way Hardcase #4 ended with our heroes suddenly facing some off-panel figure they seemed to recognize, I figured I’d just managed to "forget" someone that had been rather minor up until now…so I was looking forward to the "reveal" in this issue. But as we open up, we find Hardcase and the Strangers underground (I thought they were still aboveground where we’d left off) and facing an Aladdin agent through some pink force shield. The shield prevents anyone from attacking/using their abilities against the Aladdin folks, and unless they agree to join/work with Aladdin, our heroes aren’t going to be allowed to leave. After some back and forth between the two groups, Grenade realizes there’s a loophole, and seems to start a fight with Hardcase. They can’t use their abilities on their captors…but they CAN against each other. And if their captors get caught in the ricochets, well, that’s just too bad for them. Our heroes escape, though the captors aren’t far behind. Hardcase pauses–he’s going to destroy Aladdin’s DNA labs, as they’ve already violated his old friends by digging up bodies and harvesting their DNA. The Strangers wind up helping, though this means further fighting with Aladdin’s own Ultras. Of course, they’ve got a better idea of what to expect and have continued to learn about their own abilities…so achieve a momentary victory. Realizing at best they’d deal with this single base, a deal is struck–The Strangers (and Hardcase and Choice) walk away. No retaliation from either side. Aladdin keeps their data, our heroes get their freedom to fight another day. No one’s happy about it, but the confrontation ends without any deaths. Perhaps it’s the larger cast being juggled here, but it seems like there are a lot of little "moments." 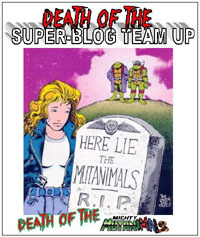 We have the sorta heavy-handedness of Atom Bob’s obvious interest in Choice; we get Spectral tending to Lady Killer; Zip-Zap marveling at this group that accepts him without belittling him for being "just a kid," and even Hardcase gets a bit of a mentorship role with the group, as he’s been at the Ultra-hero game longer than all the rest. 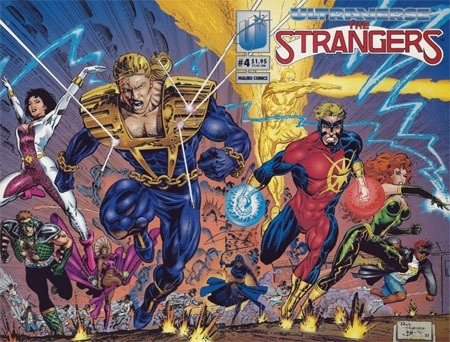 As is definitely a recurring thing as I’m going through these early Ultraverse issues–there’s a lot crammed into any given issue, overall. What we’ve gotten in just four issues of one title from 1993 would probably be stretched to at least 12 if not 18-24 with the way comics are "done" in 2018. There are some leaps of logic and plot holes–and this isn’t a 100% smooth continuation from Hardcase #4. Some of that seems likely that the co-plotting happened, but final fine details weren’t necessarily worked out in time to be reflected properly. 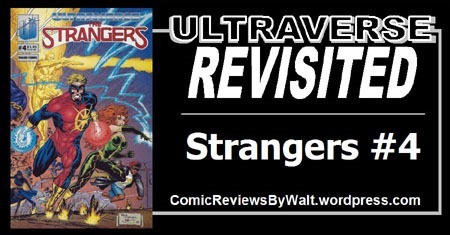 That said…if one is just reading this one title, all they really have to know is that the Strangers went to Hardcase’s place and he joined them to fight these Aladdin folks. That can be picked up from context, so the fine details aren’t as important as such. And of course, twenty-five years ago you didn’t have "everything" available digitally or in guaranteed-everything-will-be-put-into-collected-editions, so it was essentially "expected" that one COULD "miss" an issue (not that it would be encouraged). Visually I definitely enjoyed this issue. I recognized al the characters, and everyone looks good–on form–and the action and such is easy enough to follow. I didn’t get taken out of the story by anything wonky or having to really scratch my head wondering what I’d missed form one panel to the next. Whatever the specifics and logistics of a story going across multiple titles…this felt like an organic sort of thing. It’s not part of some big event, it’s not even actually "chapter one" or "chapter two" of however many parts; it’s not some "structured crossover" or the like. We just have characters that share the same world interact as they would, SINCE they share the same world and are aware of each other. We had several issues to establish the Strangers on their own, and now they’ve touched base with the wider world…though things are about to "come back home" for them with Deathwish in the next issue, apparently. 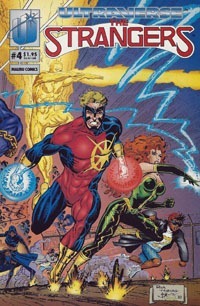 The cover is quite familiar, as it is the "second half" of the front cover from Hardcase #4. Given the placement, though…where Hardcase #4 had a gatefold front cover where the Strangers part folded out…this issue has a wraparoud cover where the Hardcase part is the back cover. The two issues can fit together to make up the single image, and the two issues can each stand alone, giving the full image. No variants in sight, no being forced to buy multiple copies of the same issue chasing some ubiquitous, over-hyped gimmick. If you can find the first few issues as well as Hardcase #4, this issue’s quite worthwhile. It’s surely got its long-term importance in the grand scheme by itself, but this would be best enjoyed along with Hardcase #4 at least.